The name Betfred is now synonymous with the gambling industry. Over the last 50+ years the company has moved from very much a brick-and-mortar bookmaker into one of the most innovative online bookmakers in the world. With each year the company continues to grow, mainly down to the development of markets and sport such as horse racing. As a UK and mainly European based bookmaker it’s understandable that horse racing will provide a massive part of their turnover and it’s for this reason why they have spent so much time and money developing this side of their betting site. 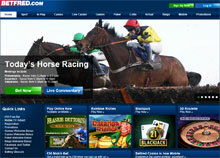 New users can claim a free bet of up to £50 upon registering their account. The free bet is a 100% match on your initial deposit and can range between £5 and £50. Once you have deposited and placed your bet then your account will be credited with the amount of your first bet. Betfred manage to cover a huge amount of races from countries around the world. Their bread and butter definitely come from the UK and Ireland with all of the major meets and majority of smaller meets being well covered. These include races on grass and all-weather surfaces. Where they have probably excelled over rival bookmakers is the inclusion of international races. Meetings from France, South Africa, America, Dubai and a host of other destinations around the world have made it one of the most diverse horse racing bookmakers in terms of demographics. It’s also pleasing to see a bookmaker include a host of lower grouped races that other bookmakers simply over look. Whilst the bigger meets and the top grouped races are covered by pretty much every bookmaker on the planet, it’s the inclusion of diversity to their markets that sets bookmakers apart, and this is certainly something Betfred have successfully achieved. Betfred have included Win, Each-way, Forecast, Tricast, Exacta and Trifecta betting markets to their betting options. Whilst this covers the main bases for the majority of punters, it far from sets the industry alight in terms of number of markets. That being said, they do allow access to a wide variety of Ante-Post markets, understandably from the bigger meets. Often markets are put together up to twelve months in advance of the next race or meeting. The likes of the Grand National, Cheltenham Festival, Betfred Golf Cup, Champion hurdle and Ladbrokes World Hurdle are some of the bigger Ante-Post markets. One of the reasons we think Betfred is so popular with punters is their interactive race card. It is simply superb and our review of it simply won’t do it justice. Nevertheless, here it is! After you have selected your race you are taken to an area which provides information on the race including distance, track length, if there will be a draw advantage and if so where, full form of each horse, jockey and trainer, a head to head overview, weight, silks colour and a video of each horses last run (where applicable). But the best bit about it all is its integrated predictor. The predictor gives an overview of where it thinks each horse could finish taking into account all of the variables that we have just listed off. This takes all the leg work out and away from the punter and ranks each horse in how they are likely to finish. Not only is this available on the win market, but you can change it to show you place market, how each horse will perform on the current going and the best jockey/trainer combination in the field. On the whole Betfred is up there with the best horse racing betting options. You can’t help but feel that they are so close to becoming the ultimate horse racing outlet but a few niggling things have let them down; the main being the lack of markets on offer. The number is fine, but it’s not great. A few added markets could really set the site apart from its competitors and it’s something that seems so simple to do. But the inclusion of features such as the superb Interactive Racecard really does make it one of the best sites to use for horse racing. We are massively impressed with how well Betfred has done over the years that it’s so easy to recommend such a fantastic company. Visit Betfred – Up to £50 Match Bet!